TWSF is trying to be reallllllly good about using ingredients we already have in the house. Our plants have produced an abundance of jalapeños, Chuck's family gave us homegrown green peppers, and we still had some fancy eggs left that needed to be devoured. Huevos rancheros fit the bill and completely delivered on vibrant flavor. 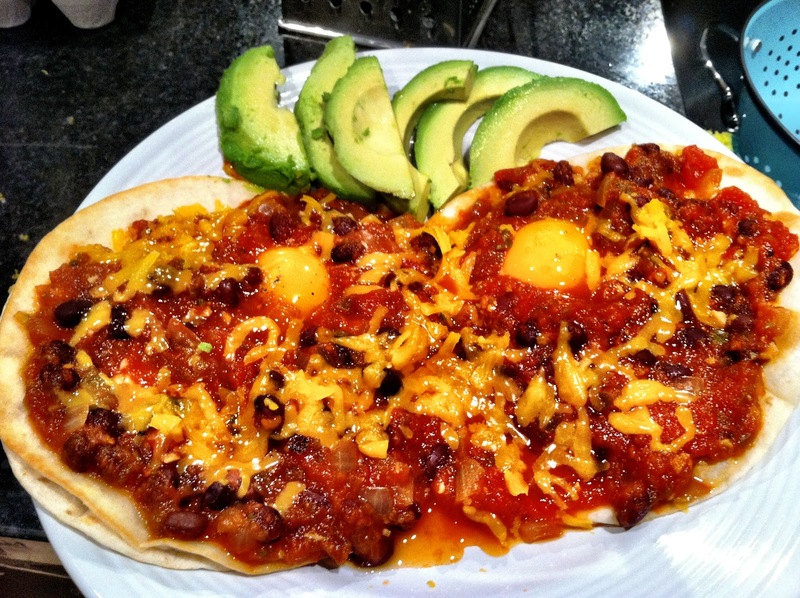 You can often find huevos rancheros on a brunch menu, but we thoroughly enjoyed it with a Corona for dinner. 1. Salsa - Heat a tablespoon of canola oil over medium heat. Sauté diced onions until slightly translucent. Add minced garlic and a pinch of cumin, and sauté for another 2 minutes. Add whole peeled tomatoes with juices, jalapeno, and peppers. Using an immersion blender, blend all ingredients together (if you do not have an immersion blender, put ingredients instead in a blender, then return to the pot over the stove). Once ingredients are combined, add salt to taste. Add black beans (we used Goya canned beans), stir, and bring to a boil. When the salsa boils, turn the heat down to medium-low until the rest of your dish is ready. *Note: Extra salsa may be refrigerated and served with chips! 2. Tortillas - heat canola oil on medium-high heat. Stack two tortillas and place in skillet. After 30 seconds (bottom tortilla should be slightly golden), flip stack. While the bottom tortilla is cooking, flip the top tortilla so that the uncooked side is facing up (you'll begin to see the bottom tortilla puffing up). Again, flip the stack and flip the top tortilla so that the uncooked side is facing up. Flip the entire stack once more, allow to cook for 30 seconds then set tortillas aside in a warm over (approximately 200 degrees F). Repeat with remaining tortillas, cooking two at a time. 3. Eggs - Well, it really depends how you like your eggs done. We fried ours in a skillet over medium heat and they were perfect. 4. Putting it all together: Place on tortilla on the plate and top with shredded cheddar cheese. Top with another tortilla and egg. Sprinkle egg with salt and pepper, and top with a generous ladle of warm salsa. If you'd like, sprinkle a little extra cheddar and cilantro as garnish. We love avocado and served it as a side (HIGHLY RECOMMENDED).